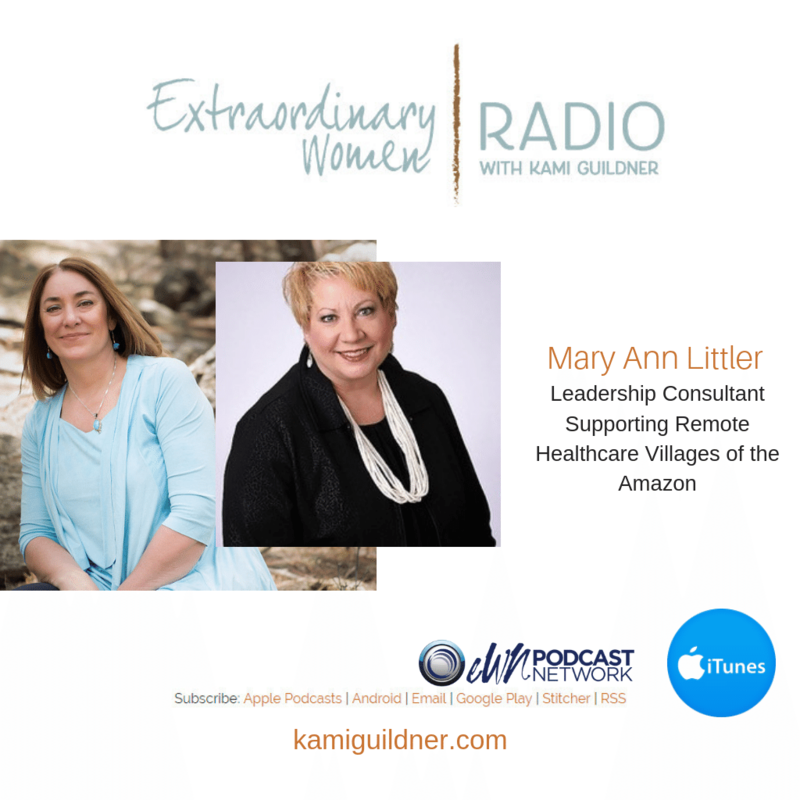 I’m thrilled to bring you today’s Extraordinary Women Radio guest – Mary Ann Littler – as we have worked and played in connection and collaboration for years! Mary Ann is a friend, has a been a client, and we served on the American Diabetes Association board together. In addition, Mary Ann serves on my advisory board for Extraordinary Women Connect. She’s an extraordinary woman that I’m honored to call a friend. Mary Ann has been doing some amazing work in Peru, supporting the health care system in the remote villages of the Amazon… which she’ll share in the interview today! Her stories about travelling into these remote villages to make a difference are touching. We jam about the life transformation that Mary Ann has journeyed through, and dive into the importance of honoring people – their gifts, their skills and their dreams – and how good leadership can impact people’s lives both professionally and personally. She is the CEO and Founder of Peak to Peak Business Strategies – providing executive & business coaching and business consulting. She enjoys speaking, teaching, coaching and consulting for clients on a global basis. Her impressive 36 year career spanned international business development, operations, customer excellence, product management, team management and sales leadership. She’s rapidly grown her consulting business, grounded in this expansive background and experience. To learn more about Mary Ann Littler, you can follow her on her website: www.peaktopeakbusinessstrategies.com or follow her on Facebook or Linkedin. I can’t wait to introduce you to my dear friend Mary Ann. Let’s meet Mary Ann Littler of Peak to Peak Business Strategies.